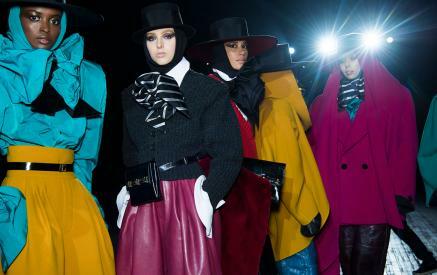 Scene Setting: Marc Jacobs has been upending the fashion show applecart these past few seasons. Instead of creating grandiose sets, he’s favoured leaving his regular venue of the Park Avenue Armory bare in all its historic glory. This season, Jacobs sat guests in two long rows arranged down the middle of the grand hall. With stark spotlights shining down on models as they trod the bare floorboards, the scene proved to be as theatrical in its austerity as other high production settings. Mood board: the stark backdrop only served to amplify the 80s, power-packed collection Jacobs sent out. From highly exaggerated and enlarged silhouettes to the palette of unequivocal colours, oversized twists of fabrics including iridescent and flocked taffetas, velvet and warp-print satin, the extravagantly sculptural pieces was provocative fodder for the eye. The menswear influences were overt, but Jacobs still imbued some sensual touches, such as nipped in waists for wide-leg trousers, colour-blocked wrap dresses, blanket-like fur stoles and a hefty dose of larger-than-life ruffles that festooned evening gowns at the end. Finishing touches: to complete the drama, Jacobs added bejewelled satin mules and diamanté pumps, wide knee-high boots and angular wide-brimmed hats that cut an opposing figure. Handbags were similarly of the era and ranged from patented and embossed leather fanny packs, attached by thin matching belts, envelope clutch shapes with gold studded hardware, suede bucket bags and shimmering quilted nylon sports bags too.